When the FBI emailed her about the announcement a week ago, she said the law enforcement agency mentioned “closing out” the investigation, which prompted her to email back asking again for a full ballistics report, which has yet to be released. “Why are you closing it if I still don’t know how my son was shot?” she replied. In a news conference, Orange and Osceola State Attorney Aramis Ayala said all 11 Orlando Police Department personnel and three Orange County Sheriff’s Office personnel who fired their weapons have received clearance letters from the State Attorney’s Office. Pulse hit the LGBTQ community of color hardest. One year later, it’s a struggle to heal. Shoot reviews are standard after any firing of a weapon by law enforcement. 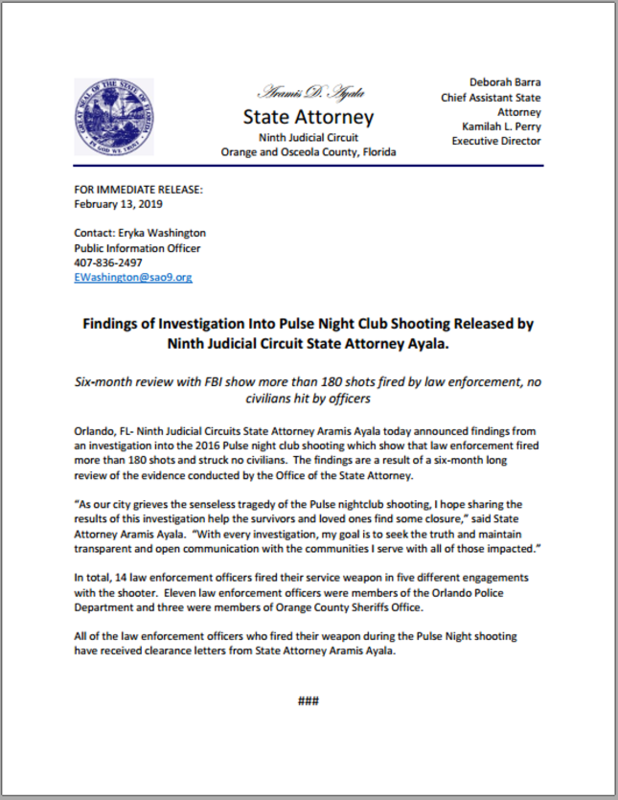 Unlike most shoot reviews, based on a Florida Department of Law Enforcement investigation submitted to the state attorney’s office, an FBI investigation was sent to the state attorney in this case. Ayala’s memo on the investigation’s findings does not mention anything about the 170-plus bullets that struck no one. Leinonen, who was a fatal accident reconstructionist and evidence technician with the Michigan Highway Patrol for a decade, wants to know exactly where they were found. “Where were the other shots? Were they wild? If Omar Mateen had lived and we were going to trial, you’d be releasing that as evidence,” she said. Leinonen finds it hard to believe that in the dark chaos of that evening, when hundreds of terrified club patrons were running for their lives, police didn’t accidentally hit a single civilian.